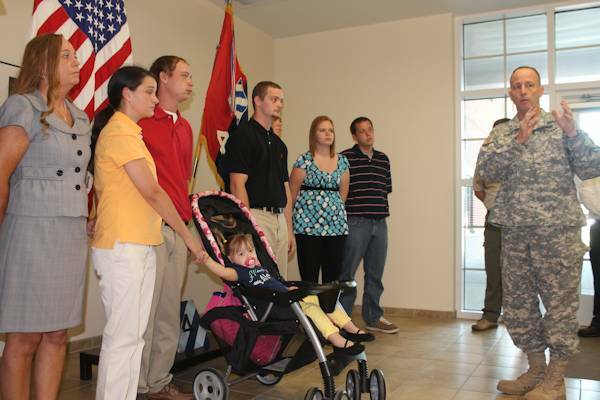 FORT STEWART, Ga. (9/25/2012) – Shane Coleman and Eric Dukes received the Outstanding Civilian Service Medal, Sept. 25, at Fort Stewart for saving the lives of two Marne family members in June. The medals were presented on behalf of Maj. Gen. Robert “Abe” Abrams, the 3rd Infantry Division commander, by Col. (P) John Hort, the commanding general for 3rd Infantry Division - Rear and Col. Kimo Gallahue, the commander of the 4th Infantry Brigade Combat Team. The medals recognize Coleman and Dukes heroic efforts to save Christiana and Samuel LeBlanc, the children of Staff Sgt. Calvin LeBlanc, from drowning off St. Simons Island. The two men swam out to the children after they called for help while swimming with their father. Sadly, Staff Sgt. LeBlanc did not survive. Hort told the soldiers, family and friends gathered for the presentation that as a former life guard he was proud of the young men and very grateful they took action to save the lives of Marne family members. He also presented them with 3rd ID coins, a traditional token of appreciation given by Army commanders for excellent performance. Gallahue, LeBlanc's brigade commander, also thanked the young men for their actions and for giving the unit an opportunity to show their gratitude by presenting them with the medals. Coleman and Dukes, both of Brunswick, expressed their humility and gratitude for the medals during a lunch reception that followed the awards presentation. They said they appreciated everything the 3rd ID had done for them. “Thanks for the awards presented to my son Shane Coleman. We will always cherish them and the ceremony was very outstanding and the food was great,” wrote Yolanda Harrison on the 4th IBCT's Facebook page after the ceremony. Certificates of appreciation, signed by Maj. Gen. Abrams and Command Sgt. Maj. Edd Watson, who are deployed to Afghanistan, were also presented to Jerry Youngblood and Trish Schaffer, volunteers with the Glynn County search and rescue team, for their contributions to the search and recovery efforts for LeBlanc. Jay Wiggins, Glynn County Emergency Management Agency director, attended the presentation and said he was very proud of these volunteers. He also thanked the 3rd ID for taking the time to recognize them for their efforts. The outstanding civilian service medal is the third-highest honor the U.S. Army can bestow on a private citizen. It is awarded for outstanding service that makes a substantial contribution or is of significance to the major command and is only awarded by a major general or above.